Searching desperately for a birthday getaway that could be done over a single weekend, I stumbled across Bulago Island on the recommendation of a friend who had recently taken the entire cast of Mamma Mia (Kampala’s amateur theatre group) there as a post-show-wrap-party. 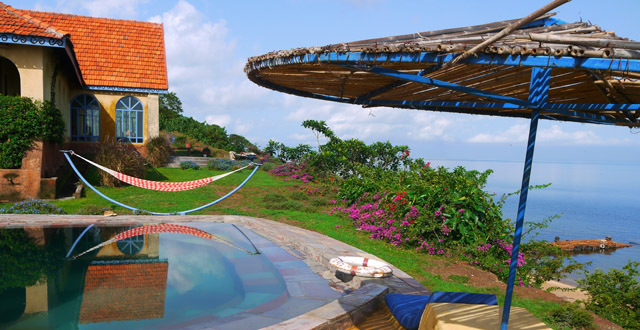 Bulago is a 500-acre island, located in Lake Victoria with a Villa offering seven bedrooms, four in the villa and three in the adjacent guest house. The villa is run by the company One Minute South led by Alison Portilus. They also sell a range of woodwork sculptures for every occasion including a rather dapper full-length bust of Museveni in full safari gear that has pride of place in the villa’s dining room. The Villa is located 0°01’S of the equator (hence the name) on the north-west corner of Bulago Island and sleeps up to 16 people. It comes with its own miniature infinity pool, hammock, volleyball/badminton net and, best of all, your own live-in chef Bosco, catering to all your culinary needs (and those you didn’t even know you had!). The island is only a 45-minute boat ride from Entebbe’s boat club in good weather (if not, plan for double that and make sure to pack sea-sickness pills!) 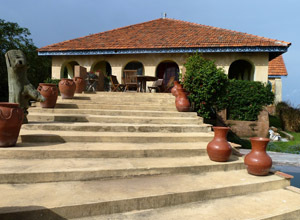 so makes a great close-to-Kampala getaway. For those who prefer to travel in relative luxury, they also offer flights from Kampala air strip, which two of our party opted for and highly recommended. This journey takes about 15 minutes. Otherwise, the boat seats up to eight people and is included in the rental price while an extra boat can be hired for US$100 for larger parties. 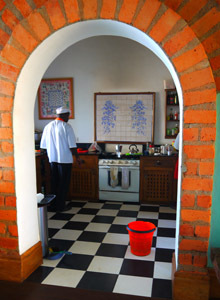 We arrived on the island to a welcome drink of freshly squeezed lemonade and samosas warm from the oven. Things only got better from there with meals including fresh lake fish, a BBQ on the beach, lunches of gazpacho and salad and even afternoon tea. Yes that’s right – as a Brit I was of course in heaven! Types and prices of catering can be discussed on booking and Bosco offers a range of options to cater to all needs (we had two veggies in our party who were taken care of). To rent the villa will cost you USD 500 for the first night and USD 450 for subsequent nights with everything included except drinks. These you are welcome to bring over with you from the mainland or can be bought from the villa itself once over there… handy if, like in our case, you run out of alcohol. We had two wonderful days and nights of excessive drinking, eating, sunbathing, reading and an excursion round to the other side of the island to check out the newly built and luxurious hotel – Pineapple Bay Resort – a rather expensive alternative. You can also hire out a boat for day trips to the nearby island of Ngamba (home to the Chimpanzee sanctuary), sunset cruises, fishing expeditions or even midnight skinny-dipping for those so-inclined. One word of caution: Try to avoid visiting on the full-moon as the moon tends to bring out not just werewolves but also lake flies en masse, which can drive you crazy after an evening of batting them out your face and fishing them out of drinks!